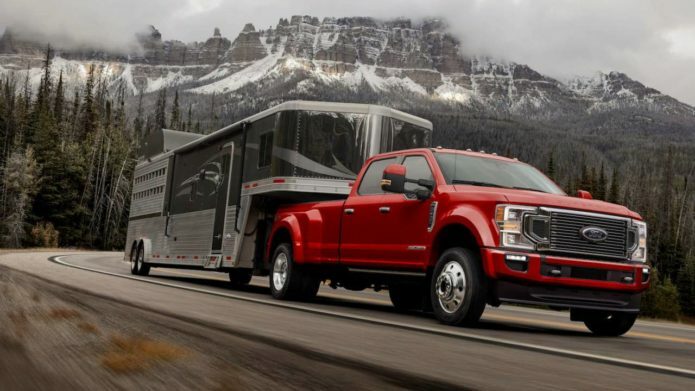 Ford has revealed the 2020 Super Duty range, and the new F-250, F-350, and F-450 promise to be the most powerful, tech-savvy trucks from the automaker to-date. A range of new gas and diesel engines are joined by a new 10-speed automatic transmission, along with some big promises from Ford. The entry-level engine will remain Ford’s 6.2-liter V8. However it’ll be joined by a 7.3-liter V8, which the automaker says will be “the most powerful gas V8 in its class” when it arrives under the Super Duty’s hood. Final power and economy figures haven’t been confirmed yet.